The Lyon College Board of Trustees has announced that Dr. W. Joseph (Joey) King will become the 18th president of Lyon. He will succeed Dr. Donald V. Weatherman, who is retiring. King and his family will move to Batesville next summer, and he will begin work July 1. 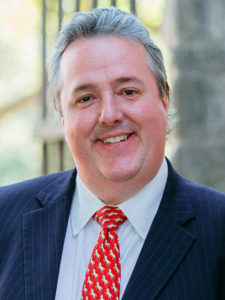 “The Board of Trustees is extremely excited about the election of Dr. Joey King as the next president of Lyon College. Dr. King’s broad experience, vision, and commitment to innovative liberal education will strengthen and further Lyon’s mission of shaping world changers. We welcome Dr. King to Lyon with open arms,” said board chairman Perry Wilson of Little Rock. A Texas native, King holds a Ph.D. in human-computer interaction from the University of Washington and a B.A. with honors in computer science and experimental psychology from Southwestern University (Georgetown, Texas). King comes to Lyon from Emory & Henry College, where he is senior advisor to the president and interim executive director at the National Institute for Technology in Liberal Education (NITLE). He previously served as NITLE’s executive director, helping almost 140 liberal arts colleges integrate inquiry, pedagogy, and technology to become stronger institutions. He has worked at Rice University, Southwestern University, University of Washington, and the Texas Christian University Neeley School of Business, where he was a finalist for Most Inspiring Professor. He has also been a research scientist at the Human Interface Technology Laboratory at the University of Washington, the Advanced Telecommunications Research Institute, and Hughes Research Laboratories. He has served as a consultant and advisor to Hanson Robotics, Microsoft, Interval Research, Walt Disney Imagineering, and Atari Games. In addition, King has wide-ranging experience as an entrepreneur, co-founding Grifiti, a technology accessories provider; serving as president of Zama Networks, a quality of service network provider acquired by Mitsui & Co; working as chief scientist of F5 Networks, the industry leader in network traffic management; and serving as the managing director of Trinity River Ventures. King also has extensive fundraising experience with both for-profit and non-profit organizations, having raised over $100 million in private capital for new ventures and successfully solicited over $25 million in gifts and grants for non-profits. In addition, as a trustee for Southwestern University, he served on the campaign cabinet that raised over $125 million.